As a rule, manufacturers of machines use overhead cranes to move them. However, there are times when the weight of machines exceed the lift capacity of the crane. Investing in new cranes does not make sense when only a few of these machines have to be moved every year. 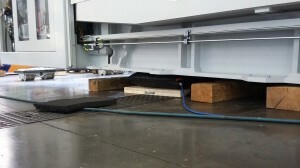 This forces the manufacturer to look for alternative lifting tools so that the transport rollers can be inserted under the machine. One of the manufacturer of these machines contacted Pronal in order to find a simple, rapid and mobile solution. Due to its low weight and its thickness, high-pressure lifting bag can be used in several fields such as the construction, the industry… Unlike the hydraulic jack, they have a very small footprint at rest. « Several of our production machines are heavier than the capacity of our crane. Due to limited budget we were not able to invest in a new crane jut to lift about 10 machines per year. Therefore we had to find a solution to lift the machines and place transport rollers underneath them. We contacted the company Pronal who recommended his lifting bag for the job. 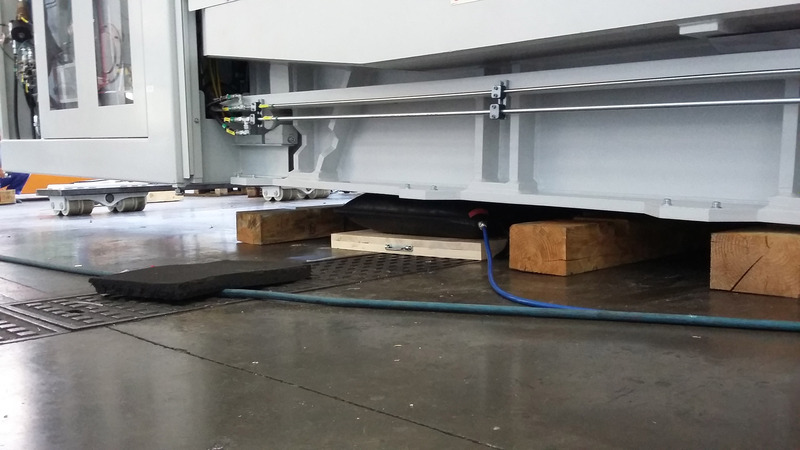 After placing 4 CLT high pressure lift bags under the machine, we were able to lift it to more than 115mm height ! The lifting bag is remotely inflated using an inflation controller. By using this device, the safety of our workers during the process of lifting was guaranteed. From now on we are going to equip our assembly teams with this lifting system because high capacity cranes are not always available (new construction).